SUSAN MOSEMAN has been the creative force behind our holiday photo card collection for many years now. Each year she comes up with wonderful designs, innovations and embellishments to delight our customers. She’s also responsible for finding beautiful photography to feature on our photo card collections. 2012 marks the first year Susan lead the design of the holiday greeting cards and invitations collection, too! (She’s also a gourmet cook and a gifted gardener. Yes, she's amazing!) What better time of year to introduce you to this prolific, multi-talented member of our Design Department? How long have you worked at William Arthur? Almost sixteen years! What are some recent and current projects? I’m on a yearly cycle designing William Arthur's Holiday Greeting and Photo Card lines, as well as our new Holiday Entertaining Collection. Each spring I work with our Creative Director, David Evans, on our booth for the National Stationery Show. This past spring also planned the dealer event that we hosted at the Society of Illustrators in New York. What do you like most about your job? That I can bring my love of Christmas, family, friends and celebration to my work. What is the last thing you bought? A can of Byrdcliff Blue paint. 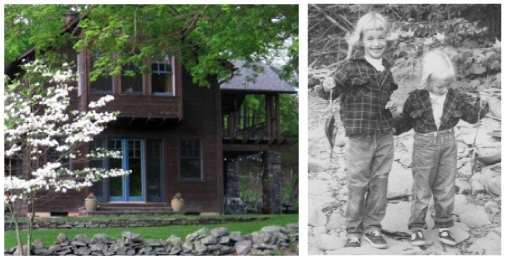 On a recent visit to my hometown of Woodstock, NY, we stayed in a house that was part of the Byrdcliff Art Colony. The architecture is reminiscent of rustic Swiss farmhouses with gabled roofs, deep overhangs and porches. The Byrdcliff buildings are sided in rough pine stained brown and the doors and windows are painted teal blue. My house in Maine is on a smaller scale, but has some attributes of a Byrdcliff house, like the one shown below. Now I'll have a door to match! What is your most precious belonging? A collection of family photographs. It's a range that includes my stern Scandinavian great grandparents right through to my beaming grandsons. My mother was a diligent photographer of our childhood; my younger sister and I treasure this image of our first fishing trip. What is your current obsession? Anticipating the first snowfall. Which artists inspire you? Every day I'm inspired by the artists I work with regularly, especially David Evans and Maine artists Pat Hardy and Susan Van Campen. Can't live without... being outdoors. Skiing, biking, canoeing and hiking. I'm revitalized by exercise, the changing seasons, weather and the landscape. What are some of your favorite museums? Nearest to my heart is the Woodstock Artists Association because it was a big part of my early art experience. The Cooper-Hewitt, Farnsworth and Isabella Stewart Gardner are some of my other favorites. What's one thing about design that you already knew at age 18? It's about composition and color.